You have heard and read about the success that can be created from building a home business. Your problem is understanding how to actually build a successful business out of your home. Many people will not take you serious and therefore, you do not take your business seriously. This leads you being distracted in your home and not giving your business the proper attention it needs. It takes real dedication and focus to successfully do business from home. Doing business from home should be taken just as serious as working out of an office. You will need to focus on marketing your business, gaining customers, earning money, and growing your business beyond its initial starting point. When these are the objectives that you are focusing on, you put your home business in the position to succeed. Growing your home based business into a six figure empire will require you to implement the most effective actions and operate with a successful mindset. This will help you increase your level of productivity and take your business to another level. 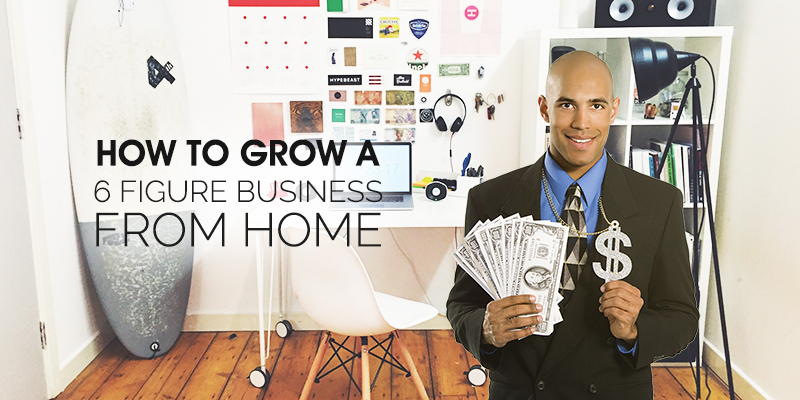 The following eight criteria will help you build a six figure business from your home. The target market you are looking to serve has a particular need that is not being met which you can service. Do the research and ask questions that will uncover what these needs are before you register the company. You do not want to miss a chance to partake in an underserved market just because you overlook the opportunity that exist in front of you. Sometimes it is not about following your passion. It is about pursuing the opportunity that will pay you for your skills. You will need to really analyze the customer base you are seeking to serve. Is there a problem that exist which keep them from achieving a certain experience or operating at the desired level? Once you determine what this problem is, create a solution that they cannot ignore. This will allow you to create value which people will have no problem paying for. Once you provide value for one person, the referrals will start to roll in as happy customers express the value you provide to their family and friends. This will increase the demand for your products and services, which will help your business gain recognition. Now your business has a thriving customer base which keeps growing. Although you will want your business to grow quickly, you will need to have patience so that you do not lose focus. It is easy to want to give up when your business is not growing at the rate you believe it should. Even when you have this thought in your head, you will need to stay committed to your business. Give yourself a goal of 3-4 months to experience a certain level of growth for your business. Within this timeframe, work as hard as you possibly can, focusing on achieving daily, weekly, and monthly goals.These goals will distract you in a good way, as all your focus is on growing your business incrementally. Now you are not really distracted by the perceived lack of growth of your business because your mind is committed to seeing the goals you have set being accomplished. If you feel you are starting to lose focus, then remind yourself of your vision. You want to give yourself the encouragement to keep going by remembering why you started. This motivational push should keep your performance level up and give your mind the positive reinforcement it needs to remain focused on building your business. Service businesses are great to operate because you need a little money to get them started. You most likely possess a skillset that can earn you money quickly. Create a business around this skill set and push your services to those that need them. As you grow, you will be unable to keep up with demand by yourself, forcing you to hire other people help you meet demand. Service based businesses offer quick cash that can be reinvested into products. Products are the best way to grow into a million-dollar business because products can be sold anywhere at anytime. Products are also not time-consuming, meaning you do not have to do the service in order to get paid. Unless you have employees providing your services, your ability to earn money will be stifled by how many clients you can efficiently serve by yourself. Your brand needs to relate to the target market you are serving. It needs to define the lifestyle that they live or the business that they operate. This will help you easily sell your products or services because your customers identify with what you stand for. If there is no connection, it will be extremely hard for you to sell a large amount of products and services. Your brand is distinguished by the value of products or services you offer. It becomes recognizable by the content you push into the marketplace. This will be your blog, videos, podcast, books, magazine appearances, and speaking engagements. Do all of these things frequently and provide great value while doing so in order to build the recognition of your brand. Nike, Mcdonald’s, and Apple all have strong brands because they give their customers exactly what they want. People from all over the world recognize their logos because their brands have been built into international brands. This was accomplished due to these companies focusing on providing value in combination with communicating why their product was the best among their competition. Just because you work from home it does not mean you are not operating an actual business. You will need to train yourself to treat your home as a place of business when you are working. Designate an area of your home which will be your home office. Set your working hours and stick to them. Let your family know when you will be working in your home office, and communicate to them that these are times when you should not be disturbed. Eliminate your distractions, such as the television, internet surfing, and your bed. Hold yourself accountable for your actions and make sure that you complete your work in a timely manner. This will also mean that you have to learn how to shut your business mind off when it is time to spend time with your family. Give them the attention that they need and you can get back to work after everyone is asleep. You do not want friction to occur in your home due to your business. Communicate to your family that ensuring your business is successful is very important, but that you are working hard to make their lives more comfortable and better. Your customers are real people, which means you will need to create real relationships with them. Developing real relationships not only helps you keep customers but it also creates loyal customers. Loyal customers are those people who will support your business through thick and thin because they know that you care about them as a person, and not just another customer. You can create real relationships by sending your customers thank you cards and cards for the holidays. Send them emails asking how their quarter was or expressing birthday wishes. Take time to speak to your followers on social media and at your speaking engagements. Answer their comments on your blog and support their business or blog. Building relationships is a two way process, meaning you will have to give a little of yourself if your customers are supporting your endeavors. Do not just provide a product or service. Provide value too. Value is when you help your customers achieve, growth, or success from using your product or service. This is accomplished by knowing exactly what your customers need and delivering the products or services that are tailored to satisfying their specific needs. This is how value is produced. When you provide value to your customers, they are eager to share your business with others. They want other people to experience the same level of satisfaction that they are receiving from working with your business. The value you provide will literally start to market your business better than the marketing channels you invest your money into. When you begin to compare yourself to your competitors, you will either think less of yourself or you will believe you are light years ahead of everyone else. Both will negatively affect your mindset, causing you to become distracted by self-limiting thoughts or ego inflated thoughts. Neither will be good for your business as they will set you up for failure. Your only focus needs to be on your business and ensuring that you build it to be the best business possible. These eight criteria will help you build your home business into a six figure business. Follow if you want to ensure that your home business is successful. Looking to Set Up a Homebased Business in Singapore? Rikvin is leading agency in Singapore providing an easy path to incorporate business and helping with all the ongoing process.